OnStar, a wholly-owned subsidiary of Gneral Motors (NYSE: GM) showed its smart-energy management solutions via a host of demonstrations that show how OnStar can be used with smart-grid technology. The integration and demonstration of the OnStar smart energy management technologies was part of a demonstration program with participating utilities across the United States. The program was made possible with a grant of more than $30 million from the Transportation Electrification Initiative administered by the U.S. Department of Energy through the American Recovery and Reinvestment Act. Demand response – This solution will connect utilities to companies like GE and Comverge that have intelligent energy management products. GE and Comverge demonstrated the use of OnStar to continually monitor and manage energy usage for Volt customers who opted in for the service. This is a future service that allows the customer to save money on energy costs while enabling more efficient use of the electric grid. Time-of-Use (TOU) rates -- OnStar can receive dynamic time-of-use pricing from utilities and notify Volt owners of the rate plan offers via email. Owners can even use OnStar to load the rate plans directly into their vehicle and access them to schedule charging during lower-rate periods. Data gathering -- OnStar also sends and receives EV data that helps utility providers without having to interface with the vehicle’s electric vehicle supply equipment. This includes location-based EV data that identifies charging locations and determines potential load scenarios. 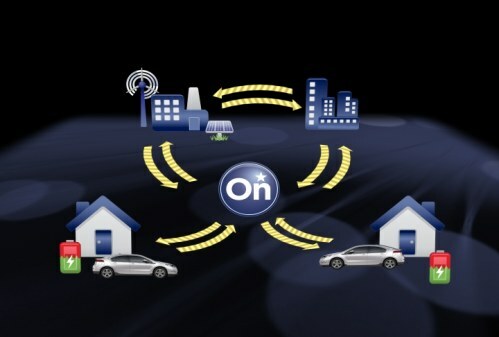 Vehicle-to-Home Integration Technology—OnStar exhibited alongside Tendril to provide attendees with a look at how the Tendril technology platform enables vehicle-to-home integration, simplifying energy management and the implications for future connected home applications. Although currently available on more than 40 MY 2011 GM models, the release revealed OnStar soon will be available for installation on most other vehicles already on the road through local electronics retailers, including Best Buy. The DistribuTECH Conference and Exhibition also covered automation and control systems, energy efficiency, demand response, renewable energy integration, advanced metering, T&D system operation and reliability, power delivery equipment and water utility technology.